Back when this show first aired, I checked out the first episode because of multiple recommendations due to my love for Azumanga Daioh. The first episode bored me to death, and I immediately wrote the series off. A couple of years later, I decided to try watching more of this series, because it developed a giant fanbase after I wrote it off, and many people told me that it got better after that first episode. Well, I still didn't feel that it got any better, and it never captured that magic that Azumanga Diaoh had, nor the magic that Nichijou later captured. The characters just felt annoying, the many references to old shows that I love felt like they were added to pander to old anime fans, and it just felt the show was trying to cover up for its lack of substance, instead of taking that lack of plot and working with it (like Seinfeld, or the previously mentioned Azumanga Daioh for example). While I rarely (if ever) write reviews for shows, Lucky Star has to be the worst experience that I have ever had trying to watch a show. Never have I had to force myself to get through around thirteen episodes (I couldn't get all the way through all 24 episodes, I shouldn't have even gotten as far as I did... I only stuck around because I wanted to see the episode that included the Doraemon theme), and never has a series left me feeling like I just wasted my time watching it. If you like this series, that is great. It had a giant following back when it aired, and it was something that a lot of people enjoyed. If, on the other hand, you like the idea of this series, but you felt that it was absolutely rotten to the core like I did, give Azumanga Daioh a try, as well as Nichijou. Those two series might be a lot more to your liking. Best comedy anime about otaku ever made. The protagonist is not a perfect girl, it's fun, fun and fun again. There are a lot of reference to really good and popular shows (like Initial D, Pokemon, Harui Suzumiya etc...) of the time. There is no fanservice if you exclude the opening, and there are just enough episode to don't get bored with it. 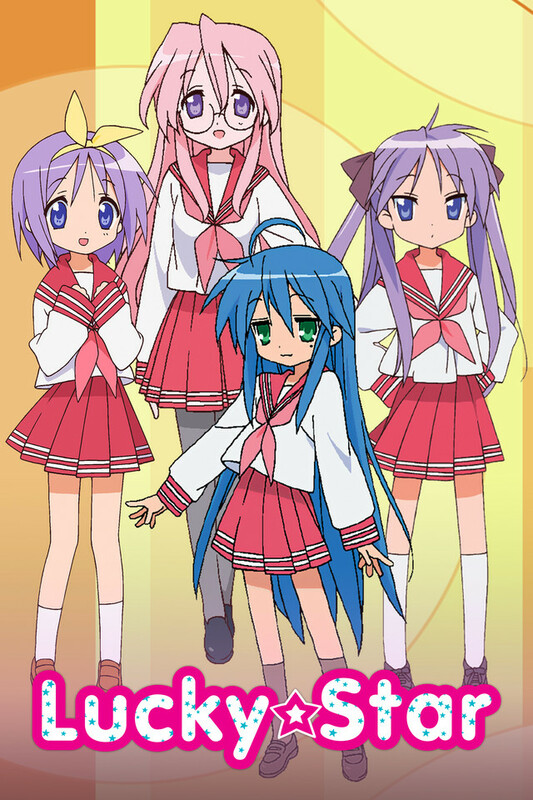 I think Lucky Star is a unique anime that you should watch, even if you are not a fan of slice of life (I'm not either) and you don't like pretty girls doing pretty things... I think the main reason is that this is more a comedy anime than anything else. It's one of the few anime that I rewatch every once in a while (just like Detroit Metal City, another small and fun comedy anime) because I still have fun with it. This is the best anime I've watched so far. If you are into slice of life anime you'll surely like it. I've watched a lot of anime and if you did too. Well, some specific anime there are a lot of other anime references you could find there. Like Initial D, Haruhi, Dragon Ball Z, etc. I found it fun to watch and it's also cute. Konata, the main character is a good example of an otaku. I also liked the personalities of every characters. If you're more into serious anime that have a complex story then this anime isn't for you, but if you like cute and fun anime I would recommend it.